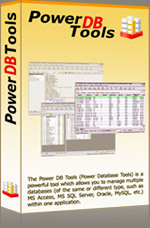 Thank you for your decision to purchase PowerDBTools. Simply click on the Buy Now link to begin the secure order process. All transactions are handled by our secure processing partner Digital River, who do the credit card payment processing for us. All order forms are run on a secure server, utilizing encryption technology to safeguard all transactions from unauthorized viewing, so you can be sure your transaction is 100% safe. Your secure online order will be processed and a registration key provided via email within minutes. You can order products using Credit Card, PayPal, Check and Wire Transfer.